Home » Crafting » Spring is coming: Break out the Glitter! Spring is coming: Break out the Glitter! When it comes to spring there are few things that make more happy than glitter and crafting. Except maybe sun and a temperature over 80, but as I see mother nature has a sense of humor this year, we are gonna go back to crafting. And when it comes to crafting in my house nothing reigns more supreme than glitter. That little annoying piece of shiny metal that instantly makes things all the more glamorous and interesting. Some people hate it but I embrace it. I don’t always like to embrace it with my KIDS but exceptions can be made considering they usually get into it anyhow. 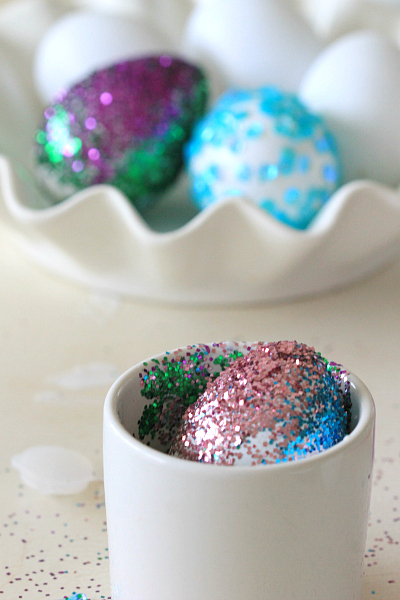 If you are stuck at home in the blaring cold and cannot go outside for some real fun, here is a good way to bring in some spring to your house and glitter-fy some eggs. Personally I like to buy the premade- $1.98 dozen of fake plastic eggs. You can glue things on them, stick things on them, paint them, color them and yes, even dye them. They cost a lot less than real eggs and your family won’t hate you for making you eat 14 egg salad sandwich recipes all week. Pretty right? This is a fun project for kids and patient moms that do not allow a little bit of fun mess! Now onto the things I DON’T like about spring. The newest thing in our house that started this week is the “Runny but stuffy” nose. Because of the weather going from 30 to 80 to 60 to 40 and then back up to 75, our house hold is fighting the war of heater vs air conditioning. As a result of all the crazy weather changes, Phoenyx has come down with the sniffles. While I don’t mind the sniffles, one thing that I do mind is him skipping naps over a stuffy or sniffly nose. Which means I have to set the things in motion to help prevent it from getting worse and him turning into a monster! One thing I do almost immediately, even at the first sign of that stuffy nose, is put in a Gentle Vapors plug. Its been my go to since P was very little and helps provide some relief so he can breath a bit easier during the night. As a PediCare ambassador I have shared with you some information on choices for your kids when they are sick and as this is my last month with PediCare I wanted to make sure that you knew about Gentle Vapors. Non-medicated vapors provide soothing comfort for your child when they’re under the weather. Night light use: Unplug unit. Allow to cool for 10 minutes. Remove pad to use unit as a night light only. Discard old pad. PediaCare® Gentle Vapors® Refill Pads are for use only with PediaCare® Gentle Vapors®unit. Do not use any other pads or oils with PediaCare® Gentle Vapors® unit. A light layer of oil may form on the unit during use. Should this occur, unplug the unit and wipe with a dry cloth. We have found Gentle Vapors at local drug stores, Target and Walmart and I keep a box of the vapor pads in my medicine cabinet at all times since you can never predict when the nose is going to ruin bedtime. Since its non-medicated, most little noses can handle the soothing smells. Mom Tip: I personally do not like the vapor smells to touch my fingers while putting them in the plug, so I use a pair of tweezers to pull them out of the bag and gently slide into the non plugged in unit. I also use them to pull it back out (unplugged) once its used. No matter whether your spring time is filled with fun (and glitter!) or running/stuffy noses, I am sure we can all agree that we are happy to be enjoying that April is upon us! Do you bring in spring in any special way? I also have it and its awesome. Actually use it on the husband as well. What can i say i have 3kids (including him) lol. Nice craft by the way.